US & East China Sea: US officials say lasers have targeted military pilots in the East China Sea | Laser Pointer Safety - News of aviation-related incidents, arrests, etc. 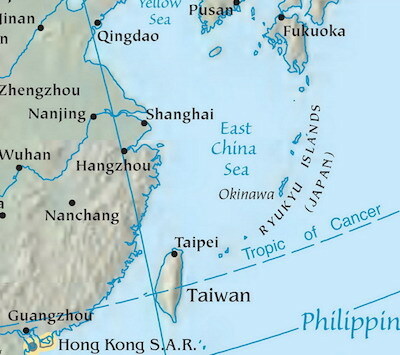 Pilots of U.S. military aircraft have reported that lasers were aimed at them from ships and shore locations around the East China Sea. From September 2017 to mid-June 2018, about two dozen aircraft saw the lasers, said to be from “smaller, commercial grade” laser pointers similar to those sold for pointing and playing with pets. U.S. officials said the low-level, harassing beams came from fishing vessels and from shore. A spokesperson for the U.S. Indo-Pacific Command said that flying procedures have not changed due to the laser incidents. She did say pilots are “employing” required laser eye protection. Disclosure of the East China Sea incidents came about seven weeks after the United States publicly accused China of deliberately aiming lasers between two and ten times at military aircraft in Djibouti, in East Africa. In those incidents, the Pentagon said “military-grade” lasers were used. Two U.S. Air Force pilots received minor, unspecified injuries with no long-term effects. Commentary from LaserPointerSafety.com: About 24 laser/aircraft incidents over nine months from boats or the shore of the East China Sea seems like a plausible number for random, unconnected civilian misuse of commonly available laser pointers. In the U.S. in 2017, there were roughly 5,600 reported incidents over nine months, so 24 incidents in the same period is a reasonable number for a less-populated area. Another indication that these may be from civilian misuse is that U.S. officials indicated the East China Sea incidents occurred from “smaller, commercial-grade” lasers which includes readily available low-powered consumer laser pointers. However, if Chinese fishing fleets are a “militia” as claimed by one news source, then there may be some coordination or central control for the laser attacks.